I'm posting a little later than I wanted to today, but I finally have a Short & Sweet Saturday card for you. 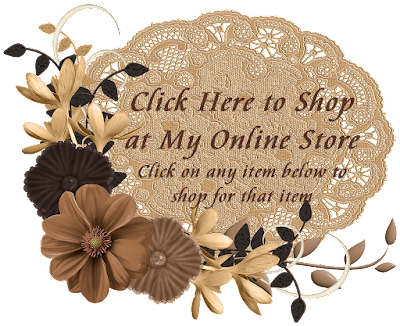 This card definitely goes along with Stampin' Up! 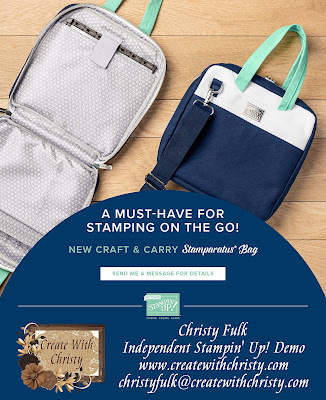 's #simplestamping campaign! This literally took me less than 5 minutes to make! The card features the super cute Bloom By Bloom Stamp Set from the 2019 Occasions Catalog. This stamp set is perfect for #simplestamping cards! The greeting comes from another Occasions Catalog stamp set, All That You Are. 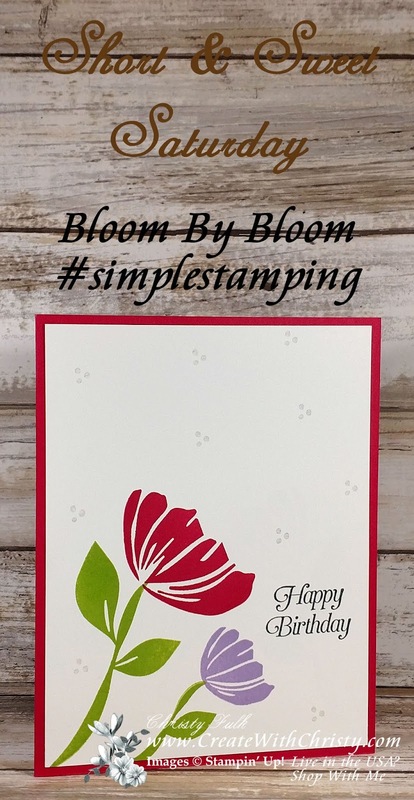 Lovely Lipstick: 8-1/2" x 5-1/2"
Whisper White: 4" x 5-1/4"
Stamp the large stem stamp from the Bloom By Bloom Stamp Set onto the bottom, left corner of the Whisper White piece using the Granny Apple Green Classic Stampin' Pad. Stamp the largest flower stamp on top of the stem using the Lovely Lipstick Classic Stampin' Pad. Stamp the small stem stamp to the right of the large one using the Granny Apple Green ink pad. Stamp the smaller-version of the same flower stamp onto the top of this stem using the Highland Heather Classic Stampin' Pad. 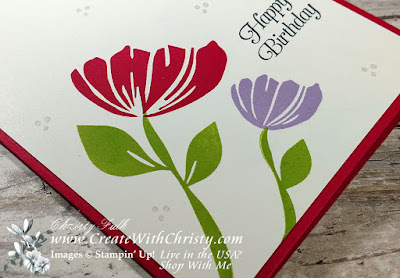 Stamp the "Happy Birthday" stamp from the All That You Are Stamp Set to the right of the flowers using the Tuxedo Black Memento Pad. Stamp the trio-dot stamp from the Bloom By Bloom set randomly on the same piece using the Smoky Slate Classic Stampin Pad. Fold the Lovely Lipstick piece in half (fold on the left) to form the card base. 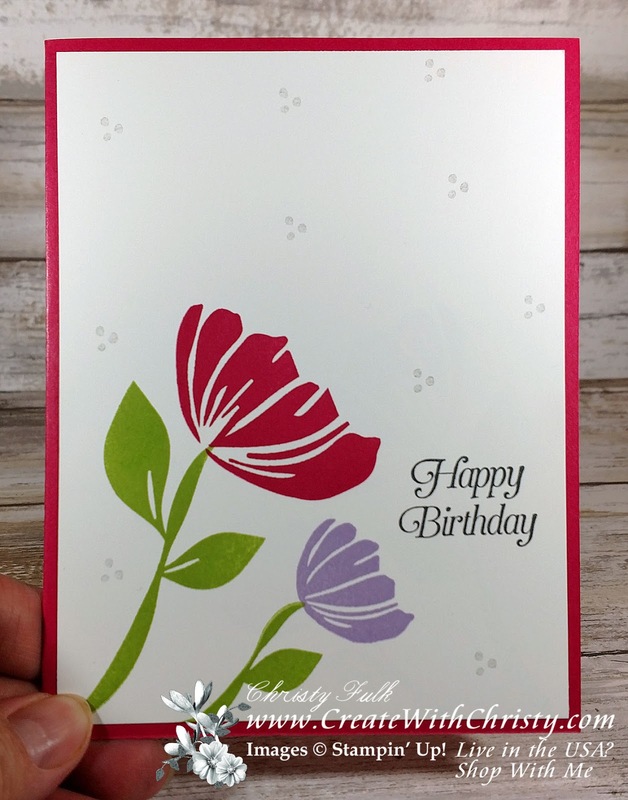 Attach the stamped piece to the center of the card front.